But wait, there’s more. Here’s the reason that the N810 moved to the head of the class. Its pocket-sized form factor may have you wishing you could run all of your Palm OS apps on the N810. Thank a company called Access for giving you a wonderful Thanksgiving Day present: The Garnet OS virtual machine (VM) enables Nokia N770, N800, and N810 platforms to run lots and lots of Garnet OS (aka Palm OS apps). Running a virtual machine of an entirely different operating system may seem like a tough job for a low-power hand-held tablet , but the svelte Garnet OS VM takes only 3.5Mb of RAM and 1-32Mb of user configurable storage space. Dave, I find you're conclusions a mystery because you never present any criteria for what YOU are looking for in a device of this type. Why is a 4.3 inch screen better than a 7 inch screen? I think it's easier to read a bigger screen, don't you? 384MB of RAM is better than 512MB? 2GB of storage is better than 4GB?But apparently this is better cause the Noika can run Palm OS in VM so you can have all the applications from your 5+ yr old Palm on it. In addition, I guess I could deduce that your criteria includes that it's small enough to carry easiy, and has GPS. Wow, that's one compelling argument - I'm returning my Eee today - Thanks! Actually, I agree with this assessment. I looked at the Eee PC with some interest, but the N810 looks so much tastier. I loved this Eee pc! Eee PC means ""Easy to learn, Easy to work, Easy to play." In my opinion it's way better then OLPC project since it has more system power. Comparing the N810 to the Eeepc on features alone really isn't fair as the N810 is pocket size and is more a PDA type device. The EeePc is more a mini laptop like the old toshiba libertto and gateway handbook neither really pocket sized devices unless you have some pants with huge clown pockets vs a hand held device . The EeePc could have been better if they used an arm processor such as the 620hmz samsung used in the iphone in place of the power hungry X86 cpu as this would give 2 to 4x the battery life or allow them to use a smaller and lighter battery. I really don't care about running XP or Vista on devices in this size class as windows really doesn't work well on small form factors. You cant compare the eee to the n180, the eee is a ultra light laptop at a even smaller cost using the arm processor can save battery but moving linux distributions from x86 makes it a bit harder (meaning less options) remember the eee is just like any normal laptop up to a point. How about we check 6 months later and see which device has a bigger market share the eee or n180, sad reality. I agree with you on everything, though those circomstances change depending on what the use of the device is. 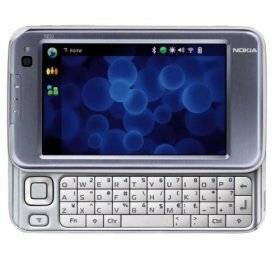 if used primarily for mobile online use, then the N810 is the dominanat species in this scenario. It is small, pocket-sized, runs the real internet like you would find on your computer, not to mention java and flash, an experience at least twice as good as the iPhone's internet experience. It is able to connect via bluetooth to your cellphone and connect online wherever you have service, and the new WiMax Edition can connect to Sprint's new 802.16 wireless connection instead of the standard 802.11. The eee pc, I believe, would be the better choice for students or business people who travel often. The compactness of the Eee PC and its bundled software including Open Office and Microsoft Works makes it very good to work on projects on the go. My sister and I both want the same kind of device for Christmas, something to get on the internet wherever we go. I chose the N810 as my gift because of its supurb functionality in this field, and it looks better and costs $100 less than the Eee PC my sister wants. If you want a device that can give you an internet experience that may rival your home computer in a small, pocket-sized device at a low cost, go for the N810. If you are more mobile and need a bigger screen and keyboard, plus the bundled office software included in some versions and don't mind the added cost, then purchase the Eee PC. I am completely agree with you. Even I am having Nokia n810. I was impressed when I just looked at it. This is a cool phone with metal & glass in a small footprint. It is kind of mini laptop with almost all applications such as e-books reading, video viewing, Skype and remote desktop application. The main cons is that its not so smooth software wise. Overall it’s a device with which you feel that you are never done with experiencing how much you can do.